This entry was posted in Environment, Transportation and tagged Chipper B. Bookmark the permalink. Was there anyone living on/ owning this boat ? No one was living on the boat. There was an owner, who was present and apparently approved this final resolution of the situation. A HOLE in the HULL being HAULED??? A three hour tour…a three hour tour. I, for one, would love to know how she came to Westport in the first place. And where she’d been previously. But I guess I won’t miss her all that much as we head out from Cedar Point YC. Really a sad story. A boat with so much potential should never have been neglected like she was to end up in such a derelict condition. Hopefully Ed does not attempt boat ownership ever again. And yes very curious who footed the bill ! In some communities people rally around those who lost a house or a boat washed ashore….. 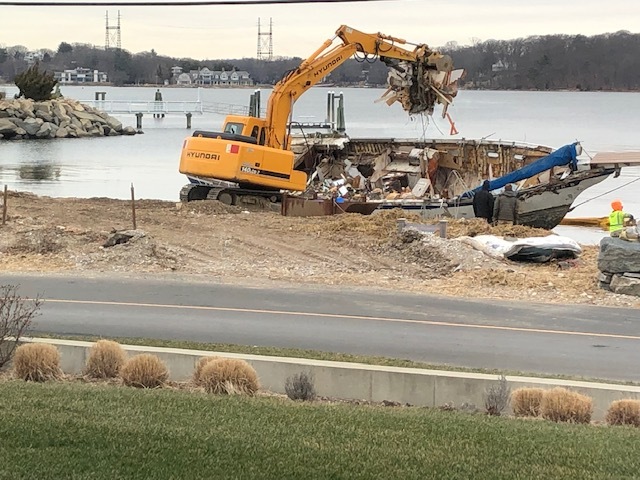 The Wetmore’s from G and C marine construction supplied the barge , tugboat, a larger excavator support boats and man power for more or less a “favor” to a boater in need and our community. I offered to help them and brought my smaller machine to assist in the floating attempt. , sadly after moving it abit it was obvious the hull was compromised beyond repair so the decision was made to demo it. My machine is equipped with hydraulic thumb so it made short work of it. Ed Train paid for dumpsters and we were able to fill 3 large 30 yard cans with a through “all hands on deck” clean up in just about 6 hours. Everyone helped, yacht club guys , the Wetmore’s , some locals boaters as well. It went smoothly without incident. The property owner and Ed could not of been nicer which made the day easy. Westport pd was on scene as well as fire even the selectman came to inspect the progress. its gone …..no cost to tax payers , all cleaned up, no more chipper b.
Robbie thank you for the update. Good to hear it was no cost to the town and things are finally resolved. I wish I could’ve been there to lend a hand but of course of all days I had to travel out-of-state. np… cool time lapse ..
Something sad about the demise of a boat like that. Makes me think that someone could have had great adventures on it. Feel the same way about certain buildings that get neglected and then demolished. I’m with you on the sadness Michael. History lost there. Unfortunately, there are a hundred thousand old fiberglass boats like this from the 1970’s and 80’s that are in various levels of decline and neglect… everything rots before the fiberglass and there is little that can be done about them except landfill. 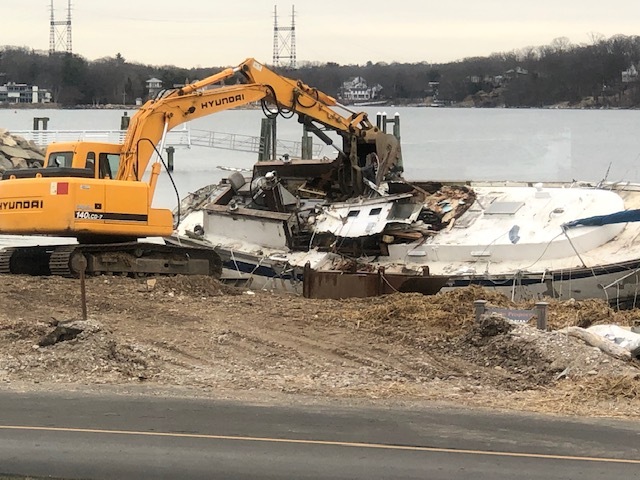 Anyone who’s familiar with boating knows plenty of seemingly “dirt cheap” deals on one-step-away-from-derelict vessels that can float but not boat. Woe is the person who, seemingly like this owner, thinks they can turn it into a seaworthy craft. True to an extent Chris. But as someone that has owned boats (both wood & fiberglass) and lived aboard… I still find it sad when they are neglected as this one was. Glad there a good size crew to help with the clean up. She had been moored on the Saugatuck River for years where the owner lived on her on and off. I believe she broke free of her mooring during the Sept. storm and ended up beached on Saugatuck Shores. According to an appeal he made on Facebook the owner tried to raise money to have her salvaged. I believe it was his intent to right her, fix her and return her to the water. I sailed on her many years ago and she was a sea worthy boat. It breaks my heart to see her final resting place is a dumpster. I can’t imagine how heartbroken her owner must be. Ed still has some work to do… whats the status on the removal of Buttered Side?